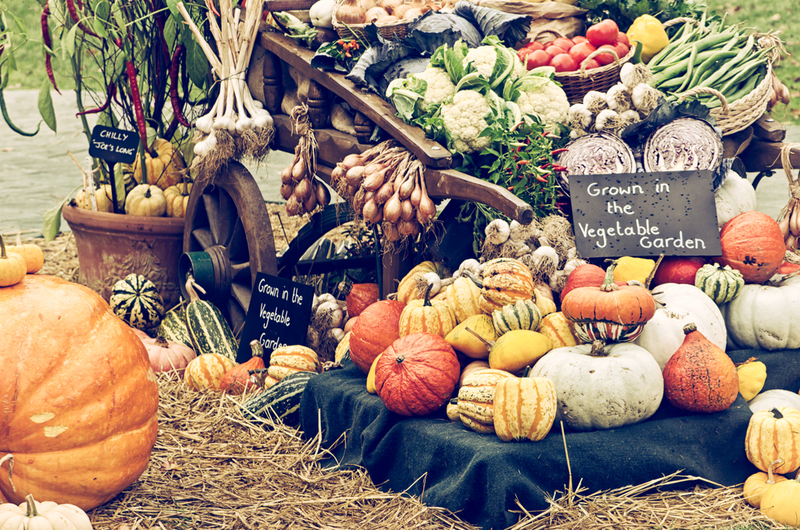 Fall brings cooler temperatures, colorful leaves and a new crop of fruits and vegetables to choose from at the farmers market or grocery store. With this new bounty comes a chance to trim your grocery bill by buying these in-season foods and storing them for the cold winter ahead. Strategic shopping for plentiful produce will help you offset an overall rise in grocery prices in 2014. In addition, knowing what foods not to buy as they hit their peak prices will save you money. When you go grocery shopping this fall, follow some sensible strategies to make sure your wallet doesn’t take a hit. By choosing seasonal fruits and vegetables, you’re not only making an ecologically sound purchase, but you’ll also save money. Stores and farmers markets lower prices to keep their surpluses of seasonal produce from spoiling. Although in-season products vary somewhat depending on where you live, you can count on finding vegetables in the squash family on sale. Look for acorn squash, butternut squash, pumpkins and winter squash. Beets are always a good bet for seasonal deals, along with cauliflower, broccoli, artichoke, eggplant, turnips, bell peppers, zucchini and sweet potatoes. For salads, grab some spinach and lettuce. September and October fruits include apples, pears, grapes, cantaloupe, persimmons, pomegranates and cranberries. If you’re lucky, you can catch the last of the tomato and peach harvests in early fall. Charts of seasonal produce are often available for specific areas, so find a guide for your area, which might offer more (or less) variety than the national average. For example, the CUESA, a non-profit sustainable food organization, provides a guide for Northern Californians, and North Carolina residents can rely on the North Carolina Department of Agriculture & Consumer Services. It also helps to know which part of the month produce seasons begin or end in your area — beginning, middle or end — so you don’t miss on any items when prices are the lowest. The fall harvest season is the perfect time to restock your wine collection. Many vineyards release vintages in September, which gives you a wider than usual selection if you’re shopping for wine this time of year. Once you’ve stocked up on in-season produce, set some aside for the off-season. Make your own juice or paste out of extra tomatoes. If you have a dehydrator, dried fruits and vegetables such as apples, pears, tomatoes and cranberries will make tasty snacks later, or you can add them to stir-frys and salads for a boost of flavor. Fall is a great time to make your own jams and jellies out of apples, pears, persimmons, pomegranates and peaches. Save some cranberries to prepare homemade sauce for Thanksgiving or later in the year. If you have an herb garden, make sure to preserve the last of your harvest. Hang herbs upside down in a dark space with good air ventilation for about a week to properly dry them while maintaining flavor. You can also freeze herbs in ice cube trays with water or olive oil. Consider making large batches of dishes out of your in-season items. You can freeze leftover sauces, lasagnas, casseroles and broth-based soups to eat later when their ingredients are no longer in season. The bounty of summer has passed, but in many parts of the country, September isn’t too late to plant vegetables for your next harvest. Supplementing your grocery shopping with homegrown vegetables is a great way to save, especially with spikes in the prices of salad staples like lettuce and broccoli. What’s worth planting this month depends on where you live, but arugula and spinach are great choices for most regions of the United States. Other options include radishes, bok choy, mustard greens and lettuce. If you live in the Southeast or Southwest, consider planting kale and turnips. Mache, also known as corn salad or lamb’s lettuce, is a great choice for gardeners in New England, the Midwest, the North Central region and the Pacific Northwest. If you don’t have an outdoor garden, take advantage of a sunny window or balcony to grow herbs. Mint, parsley and chives are easy to take care of and add great flavor to your food. As the costs of some items spike, you might want to cross them off your grocery list. The prices of some popular food items have been rising, DealNews reports, with further increases expected this fall. The list includes oranges, bacon, chocolate, cheese, deli meats, chicken and butter. Additionally, beef prices have been soaring since summer. Food prices across the board have risen this year, with increases in the cost of meat (up 9.3%), dairy (up 4.3%) and fruits and vegetables (up 2%) since July 2013. With recent droughts in California and Texas, major sources of produce and beef, respectively, the situation is unlikely to improve soon. To save money, look for alternatives to pricey products and stock up during sales. Margarine is a low-cost replacement for butter, and with sales coming up in November, turkey is a smarter choice than chicken if you’ve got ample space in your freezer. Consumers with a sweet tooth should wait for pre- and post-Halloween sales to get the best deals on chocolate.